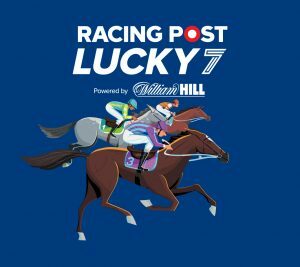 William Hill has teamed up with Racing Post for the exciting free-to-enter game Racing Post Lucky 7. Racing Post Lucky 7 – the mobile app and desktop game – where you can win jackpots of £50,000, has a fresh new look thanks to our brand partnership. All you have to do is pick the winner of seven selected races to win a huge £50,000 prize. On days when the top prize is not won, there is a £1,000 consolation reward to the top entry. What’s more, Racing Post are offering a free one-month Members’ Club Ultimate membership to all new customers which includes access to the Racing Post digital newspaper, daily tipping content, comprehensive statistics and much more! Open to new and existing William Hill customers, Racing Post Lucky 7 powered by William Hill is your chance to win up to £50,000 each week. All you have to do is select seven horses from our chosen races & you could strike gold. Even if the jackpot isn’t won, the player with the most winners will still receive a £1,000 consolation prize. Read our horse racing betting tips, updated weekly by our tipsters. Entries open from 4pm the day before each competition. Swap your predictions as often as you like – right up until the start of the first race. Check ‘Presenters Picks’ and see our pundits fancy for each race. Remember, each competition is completely free to enter with a William Hill account! 4. Click ‘Buy Now’ to complete your registration (after the trial period, either cancel or continue the subscription at the £29.95 standard monthly price*). For full terms and conditions visit our promotions page. This offer expires on 31st December 2018.